Ironman Austria will always be my favourite race because of the beautiful race course and because Klagenfurt is my home town. 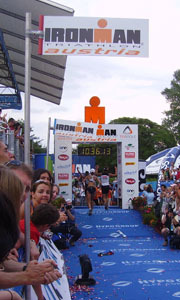 Furthermore, the IM Austria course is the fastest official Ironman course in the world and the world record both in the women’s and the men’s race have been achieved in Klagenfurt. 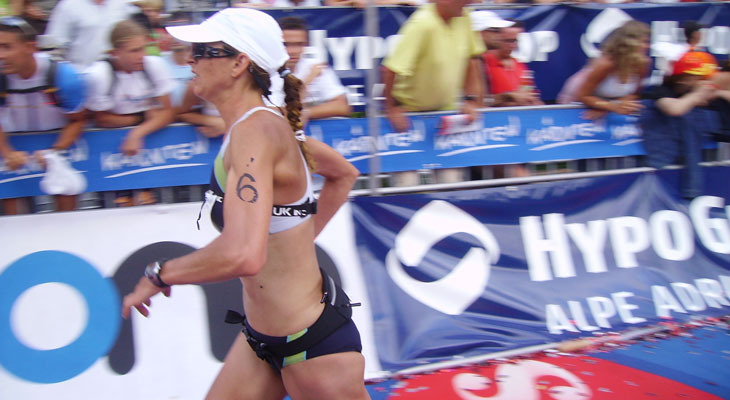 I spent about 6 weeks in Austria staying in my parents’ house to prepare for this fastest Ironman race of my career. My parents’ house is situated in a small village called Kuehnsdorf, surrounded by mountains and forrest, about 35 km from the Ironman Austria race course and Klagenfurt.In the many years in preparation for my professional Ironman career, I had been training my cycling and running in the mountains around my parents’ house and my swimming in a small lake about 4km away supported by my family. In the 6 weeks before the Ironman race, I did most of my cycling training on the official race course in Klagenfurt and almost every day I trained there with other competitors. I had the help of a local bike shop in Kuehnsdorf with a mechanic who serviced and repaired my bike so that I had an optimal preparation for the race. Because I had lived abroad since I was 24, first in Germany, then in the USA and finally in the UK, I had done almost all of my competitions internationally outside Austria. This would be the first time for me to start as a professional athlete in my own home country!! So everybody was excited and all my family took vacations for that big race day to watch me competing and support me during the race. Even the head of the Austrian National Team, Mr. Herwig Grabner would come to the award ceremony. It was great to race at home and be a local favourite! The commentators went crazy when I passed them in the race and I even had to give an interview in the changing tent from the bike to run transition. What a feeling to speek into a microphone and be displayed live on the radio while changing my clothes during a race! I won the team competition with two other athletes of my home club and a title as national champion. I loved this race so much that I improved my personal best time for about 15 minutes and that I came back the year later to do it again. 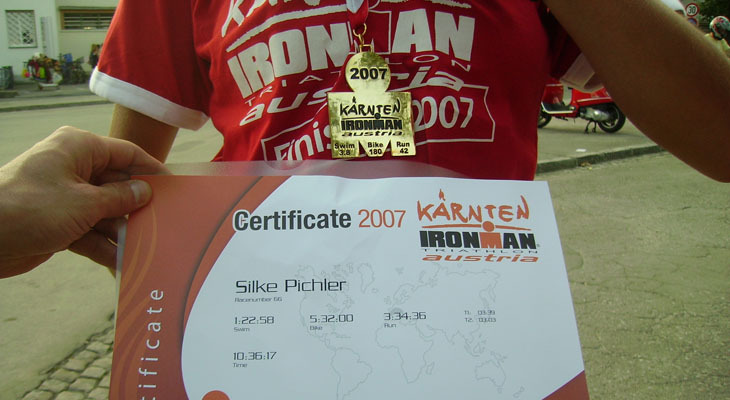 To thank all the Austrian people who gave me such great time during race preparation and especially during the race in 2007 and 2008, I worked for the race organisation Triangle and the media for one month in summer 2010 to support Ironman Austria. 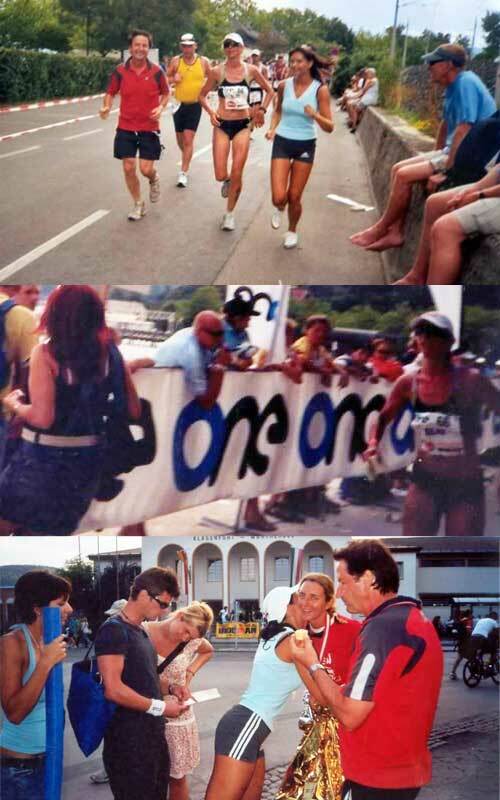 I also volunteered to participate in a cycling training camp with Marino in his preparation for his Ironman 2010 race. During race day I did the live coverage of the professional race in collaboration with Henry Budgett for Ironman Live and TriUK! More information about the Ironman bike course in Austria here. More information about the Irmonman run course in Austria here. More information about the Irmonman swim course in Austria here.